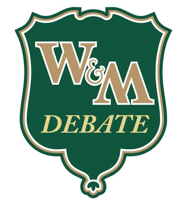 The William & Mary Debate Society competes in the American Parliamentary Debate Association (APDA) and select international tournaments. The society is currently the 2nd highest ranked public university in the nation. In 2015, the WMDS had the 2nd ranked partnership, and top ranked debater in the country. The team also holds regular on-campus debates, hosts Virginia High School debate tournaments, and a college parliamentary debate tournament. Send us an email at debateteam.wm@gmail.com.